If I create a "Page" in my app, there is no help info or reference anywhere in Quickbase help as to how to link to the page. I end up trolling thru the Community, even here I have to find it within in threads about other things. Am I missing something? 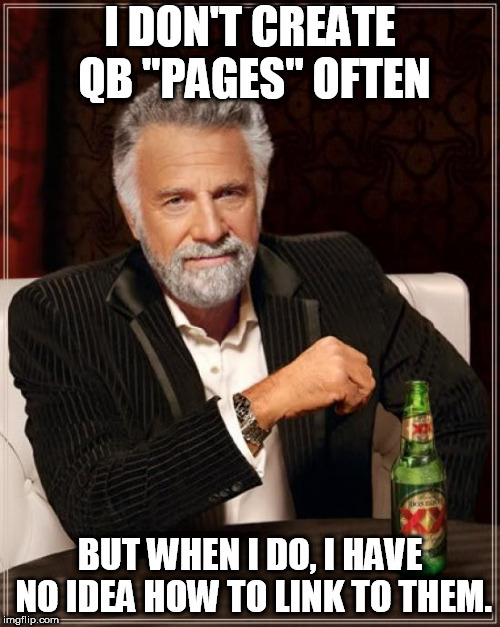 I searched QB official help for "dbpage" and only found one reference in the API info. On the Page page, you can edit, preview, or copy a page. Not a link to just view it like the rest of the world. Apparently this is how you do it, posted partly to help my future self. Hi, its not dbpage, but a=showpage if you run into an issue.